AT HOME CARE, INC. offers a wide variety of services designed to make life safer and more enjoyable for individuals needing help with daily living. 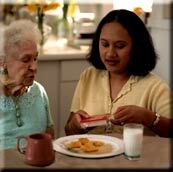 AT HOME CARE, INC's trained, licensed, and experienced caregivers include RN's, LPN's, & CNA's. All personnel are experienced, bonded, and carefully screened. Screening includes employment, character, and criminal background checks. Full-Time, Part-time, Hourly and Live-in services available. AT HOME CARE, INC. enters our 34th year in homecare with a reputation of professional excellence. AT HOME CARE, INC. continues as an industry leader in improving the options and alternatives that homecare offers. AT HOME CARE, INC's experience affords the client a delivery of service that includes skill, compassion, understanding, and reliability. These qualities produce good homecare and it is good homecare that helps patient and family cope with the challenges that illness, disability, and aging present. Clients repeatedly exclaim, "You have sent us the perfect person." AT HOME CARE, INC. is recognized in the healthcare community as an outstanding service provider. Our client population includes Convalescent, Hospice, Alzheimers, and Custodial Care patients. Let our experience help you in meeting your home care needs.